I've learned a few things over the fairly short period I've been trying to do astrophotography, here's the ever-so-cool M42 with my current capabilities. As a comparison, side-by-side from January 2010 and February 2011 the same target. Naturally, part of the difference comes from changes in equiment used, the 2010 was shot on a Canon 350D thru an el-cheapo achromatic fl=1000mm f/10 refractor with racket-and-pinion manual focuser seated on tripod-mounter HEQ5 mount and no guiding. For the 2011 version I used Starlight Xpress SXVR-H18 CCD-camera, high-quality Baader filters, guided exposures with dithering and for optics I have now access to the astro-club's William-Options 110-FLT on pier-installed EQ6 mount. Many small changes a small change in image makes. 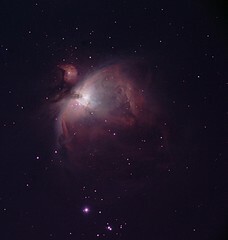 Oh, and the image on left was taken at nearly new moon, and the newer version is 70% full moon glaring right above Orion.